Aromatic Scrying is a sense-inspired way to honor the phase of the moon, and dive deeply within yourself to discover what this phase of the moon means for you. Scrying is an ancient approach to visioning. Seers would fill a basin of water, and peer into its reflection, making meaning of any imagery found there. Some saw the future. Some found inspiration and guidance. Aromatic Scrying introduces essential oils into the mix by incorporating a wonderful “aromatic steam”. We will be adding steamy water and essential oils that I’ve chosen for this moon phase into the scrying bowl; inhaling the vapors into our bodies, and absorbing them into our skin and hair. The time in the steam will feel like a mini sweat lodge experience. The oils will alter and inspire you, as will the warmth of the steam. Once you are done “steaming”, you will simply remove the towel or blanket from over your head, and then settle into gazing at the water. Make meaning of what you see. On this Libra New Moon, we can look to the most quintessential essential oil: Lavender. Full of soothing esthers, Lavender helps us slow down and relax. In proper doses, Lavender sings lullabies to our strung-out nervous systems. Like a horse whisperer, it coaxes us from hysteria to trust. For the Libra New Moon, we need to trust ourselves. 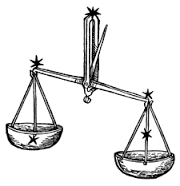 Libra is represented by the scales. Balance is what’s in order. Let’s define balance. Balance, to me, is effortlessness. Balance is making sure that the extremities are equal, so that the center is not strained. Just like there is a center to the scales, YOU are the center of your life. So, trust yourself and ask: Do you feel strained? Where are you compensating? What can you add or let go in order for the center to feel at ease? For this Aromatic scrying session, harness the energy of Libra and Lavender essential oil to help slow you down so that you can see what’s out of balance. The soothing quality of Lavender essential oil will help you relax and nurture yourself, making the decision to add or subtract things to achieve balance effortless. As you are scrying, allow your nervous system to feel as still as the surface of the water. You might meet your own gaze. See someone in that reflection that is worthy of ease. Let Lavender help you see what you need to call in and what you need to let go so that you can feel this sense of balance and comfort more often. Dark colored thick bowl, slightly larger than the diameter of your face. Begin with your breath. Inhaling neutral/clean energy. Exhaling everything distracting you. Ground yourself, so that you feel stable, connected and holding unwavering space. Begin at a comfortable table and chair. Drape your towel or blanket over the back of the chair, so that it’s easy to drape over your head. Place a bowl of steamy water on the table so that you can easily bend over it. 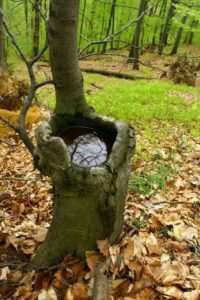 Set an intention for this scrying session. Add 2 drops of Lavender EO to the water. Keeping your eyes closed, lean over the bowl and drape the blanket over your head. Begin taking breaths of the aromatic steam, deepening your breaths as you can. You might cough a little at first. Continue until the steam has cooled. Turn off any lights that you have on. You want to be in mostly darkness, or in the light of a candle. Open your eyes, and gaze into the water. Give yourself several minutes to relax, and see what comes to you. Make meaning of what you see, and apply it to your Libra New Moon intentions. Give thanks to all of the energies that supported you doing this, whether it’s your family leaving you alone for some quiet time, or the coyotes that howled in the distance, or the earth floating between the sun and moon creating the blessed dark. Thanks for reading! I wish you a magnificent new moon cycle! Previous Post: « Vata beauty you are!